This guide presents a list of recent videos about safe sleep for infants that support the 2011 American Academy of Pediatrics recommendations for a safe sleep environment. Additional Videos Not Rated on this page. Online Multimedia Resources for additional videos, webcasts, and other resources related to sudden infant death risk reduction. The complete guidelines are described in this article: Task Force on Sudden Infant Death Syndrome. 2011 Nov. SIDS and Other Sleep-Related Infant Deaths: Expansion of Recommendations for a Safe Infant Sleeping Environment. Pediatrics. 128(5):1030-9. Epub 2011 Oct 5 17. * Comment for 17: These videos portray a multicultural audience. publication in 2005 or later. This date was selected because it is the date of the most recent statement of the American Academy of Pediatrics prior to the 2011 updated recommendations. Videos published after the updated recommendations have not yet emerged; many of the same topics as in the 2011 recommendations were covered in the 2005 statement. suitable for use with families. price; most videos are free or inexpensive. NEW! Safe Sleep Practices. (2012). Eastern Virginia Medical School. 5:50 minutes. No charge. Supports AAP Recommendations 1, 2, 3, 4, 17* A Virginia pediatric and forensic pathologist discusses infant fatalities that have occurred in the Hampton Roads,Virginia, area due to unsafe sleep practices and uses doll reenactments to illustrate these unsafe practices. The video shows how to provide a safe sleep environment by having infants sleep only on their backs, in cribs with firm mattresses and no soft objects such as blankets, toys, or bumper pads. It also discusses the importance of never sleeping with the infant in an adult bed, couch, or other soft surface. Families and dolls in the video are of different races and ethnicities. Safe Sleep for Your Baby. 2012. National Institute for Child Health and Human Development. 10 minutes. No charge. Supports AAP recommendations 1, 2, 3, 4, 5, 6, 7, 8, 9, 10, 12, 13, 14, 17* Shows parents at a picnic discussing what a couple who has just announced their pregnancy needs to know and do to reduce their infant's risk of SIDS. Topics include the following: (1) always placing infants on their backs for sleep on a safety-approved crib mattress, (2) practices followed in earlier times that are no longer considered safe, (3) tummy time for infants who are awake, (4) not wrapping infants in blankets, (5) removing items such as blankets and stuffed toys from cribs at sleep time, (6) not overheating infants, (7) not smoking or using drugs or alcohol, (8) understanding that monitors that come home from the hospital with infants are for health conditions but don't prevent SIDS, (9) avoiding positioners, (10) understanding that breastfeeding and pacifier use can be helpful, and (11) understanding that good prenatal care is important. The video portrays individuals from a variety of ethnicities and cultures. Learn How to Put Your Baby to Sleep Safely. No date. Consumer Product Safety Commission. Short version 3 minutes English, 4 minutes Spanish; long version 12 minutes English. No charge. Short version (English and Spanish): Supports AAP recommendations 1, 2, 4, 16, 17* Long version (English only): Supports AAP recommendations 1, 2, 3, 4, 6, 9, 12, 14, 16, 17* All versions captioned. Short versions portray African American or Hispanic mother and discuss back sleeping, keeping crib away from the window and from any baby monitor cords, nothing soft in the crib, a firm mattress, and crib standards. The long version adds discussions by 3 health professionals and additional more topics, including filling out the crib recall card, no pillowy bumper pads, no positioners, no bed sharing with parents and baby, using a pacifier, not smoking and having tummy time when baby is awake. Sleep Safe: Alone. Back. Crib. No Exceptions. 2010. Baltimore County Health Department. 7 minutes. Contact for availability and price: bchd@baltimorecity.org or 410-396-3298. Supports AAP recommendations 1, 2, 3, 4, 9, 17* Three mothers tell how their infants died in unsafe sleeping environments. Topics include back sleeping, sleeping alone in the crib, no soft bedding and toys. Shows unsafe practices then fades to safe practices as voice discusses correct practices (e.g., crib full of soft things, are taken out and ends with safe crib). Shows visits to grave of children who died. Portrays African American and white individuals. Accompanying discussion guide adds cultural practices, breastfeeding, tummy time, smoking, pacifiers. Safe Sleep DVD. 2010. SIDS Network of Kansas. 11:32 minutes. English and Spanish versions. No charge online. Available in DVD quality or standard quality videos, with video transcript; also posted on YouTube. Supports AAP recommendations: 1, 2, 3, 4, 6, 8, 9,10, 14, 15, 17* Discusses the Alone Back Crib rule and other recommendations, portraying couples and multigenerational families of varying ethnicities in pregnancy and with infant, including one with a sign language interpreter. Explains why neonatal intensive care units (NICUs) don't follow all the rules (infants are monitored constantly) but once the baby has come home, all the rules should be followed. Portrays a family interviewing a child care provider to be sure the care center follows the safety rules and a four-generation family discusses how older generations need to learn new safety rules for infant sleep. SIDS, Reducing the Risk. 2010. Spokane Regional Health District. 8:49 minutes. No charge. Supports AAP recommendations 1, 2, 3, 4, 6, 7, 10, 11, 12, 17* Parents discuss losing their babies to SIDS or other sudden death; health professionals discuss what SIDS is, the effects of the Back to Sleep Campaign, why back sleep is important, the proper sleeping environment (crib, no adult bed, firm surface, no soft objects or positioners, how to tuck in the blanket if one is used), why smoking even away from the baby is not advised. Individuals of varying racial/ethnic identities are portrayed. Safe Sleep Saves Lives: Back is Best for Baby’s Sleep and Other Tips for Parents and Caregivers. 2009. First Candle. 17 minutes. No charge online or $15.00 for DVD. Available in English or Spanish versions, or info@firstcandle.org (DVD) or (800) 221-7437. Supports AAP recommendations 1, 2, 3, 4, 6, 8, 9, 12, 14, 15, 17* For expecting parents on creating a safe sleep zone, room sharing but not bed sharing, and sharing safe sleep information with others who care for the baby. Portrays Caucasian, African American, Hispanic, and Asian individuals. Mentions educating everyone you know who will take care of baby, including child care providers. Infant Safe Sleep. Posted 2009. Tomorrow’s Child Michigan. No charge. Supports AAP recommendations 1, 2, 3, 4, 6, 9, 14, 17* Portrays individuals with a variety of racial/ethnic identities. Safe Sleep Safe Crib: You Can Help. Ca. 2009. SIDS of Illinois. 12 minutes. $10.00. Available in video or DVD formats, in English or Spanish. Order Form. Supports AAP recommendations 1, 2, 3, 4, 6, 8, 9, 10, 14, 15, 17* Shows an office baby shower and discussion about SIDS and accidental suffocation risk reduction tips. Topics include avoiding co-sleeping in bed, always placing baby on his back to sleep, keeping the crib clear of toys and blankets to reduce the risk of suffocation, tummy time for play, the importance of breastfeeding, pacifier use, and use of a "sleep sac" and not dressing baby over-warmly. Portrays a multicultural group of women. Safe Sleep for Your Baby Right From the Start. 2008. SIDS of Pennsylvania. 14 minutes. $20. Order Form. Supports AAP recommendations 1, 2, 4, 6, 14 For use in hospitals, doctor’s offices, health departments, clinics, and use by other groups where safe sleep practices are being taught. Covers a firm mattress, clutter-free crib, use of blanket in crib if necessary, infant sleeping alone, back to sleep and tummy to play, no smoking, and being sure all caregivers know the safe sleep rules. Safe Sleep PSA and Instructional Video (SIDS 101: Reduce the Risks). 2008. SIDS of Pennsylvania. $10. Order Form. Supports AAP recommendations 1, 2, 3, 4, 6, 9, 10, 12, 13, 14, 17 Two black women discuss which babies are at risk, 10 factors that you can change: sleep on back, firm mattress, nothing soft in crib, no smoke exposure (shows supposed smoker washing hands before handling baby), sleep close but not with an adult, pacifier, don’t overbundle, avoid products and monitors, tummy time. Ends with segment on how to assemble Pack n Play portable crib. Also has PSA showing unsafe sleep situations, e.g., on father’s chest, with universal NO sign. Beyond Sweet Dreams and Bedtime Stories: Supporting Healthy Sleep for Infants and Toddlers (2009). Office of Head Start. Practical tips for Early Head Start and Migrant and Seasonal Head Start staff that support the implementation of healthy infant and toddler sleep practices in center-based care and with families. Hot Topics in Infant Safe Sleep: An Interactive Workshop with Rachel Moon, M.D. from the ASIP-Pregnancy Loss and Infant Death Alliance 2010 International Conference on Perinatal and Infant Death (November 2010). Safe Sleep: It’s Essential (no date). Michigan Department of Human Services. (2:20 min.) Requires RealPlayer. 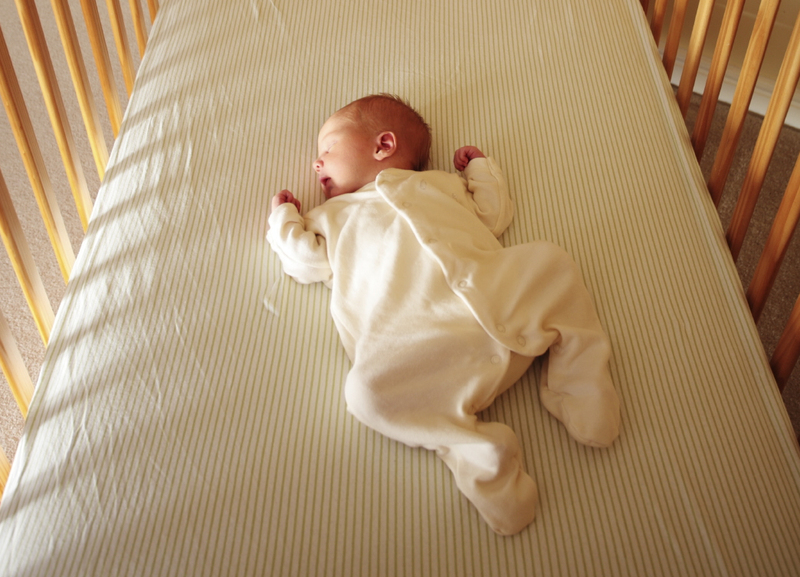 Seven Steps to Reduce the Risk of SIDS. (2006). InJoy Videos. Video for parents showing steps to reduce an infant’s risk for SIDS (14 min.). Available in DVD and VHS formats, and in English and Spanish. Available to order online.